This was a super fun project. My bff reads my blog so I couldn’t post it until I gave it to her. She and her family are camping this weekend at Sibbald’s Point Provincial Park. They don’t go often so this was a big deal for them. 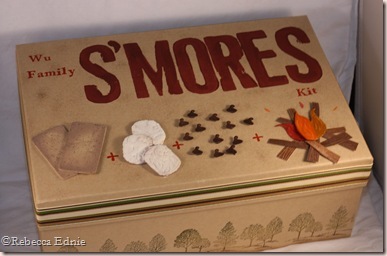 So I decided to surprise them with my version of a s’mores kit; in case you are wondering, my version includes peanut butter and chocolate chips instead of chocolate bars (cheaper too!) 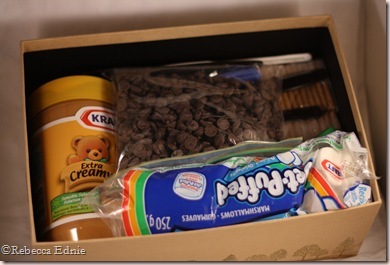 I spread the peanut butter on the graham crackers and dip that into a bag of chocolate chips. The rest is made as usual. Fun and Yummy, right? I also added bag clips to seal leftover crackers and marshmallows as well as knives to spread the peanut butter. I used a photo box as the base. I stamped trees all around the bottom using a modified rock n roll technique. I used olive over all, chocolate chip for the ground and tree trunks and artichoke for the tops of the trees. I say ‘modified’ rock n roll because normally the whole stamp is rolled in a single colour; here not only did I use two colours but I used them in selective areas. I put woodsy looking ribbon all the way around the lid and then went to work on the top. I used the SU! colour spritzer to add cocoa fly-specking to he lid. The rectangular chipboard was painted with acrylic paint, then sponged with close to cocoa ink and the dots were stamped with chocolate chip ink. The marshmallows were tricky; first I cut the edges off of circular chipboard pieces, then painted it white with acrylic paint. Then I tried Copics and dye ink sponging for a toasted look but it didn’t look quite right. So I added a thin coating of Liquid Appliqué with a paint brush. OMW, then the dye ink started soaking through and I thought they were ruined but after I heated them, the ink that soaked through just made them look toasted, how I wanted them in the first place! YEAH! The chocolate chips were stamped and individually cut out and foam dotted on. TO make the fire, I stamped a solid log stamp in cocoa ink on cocoa and caramel paper. For more interest, I stamped several logs with the stamp curved on the block. The flames were cut by hand, edges were DTP inked and I added some lines with a marker. The fire was assembled with clear pop dots. The lettering was done with foam and rubber alpha sets, with large letters in acrylic paint and the small ones in dye ink. I am so sorry that I haven’t been posting regularly. I expect to go back to my regular schedule of at least 4 posts a week starting this week. A weird set of circumstances led to not much posting. For those of you who just subscribed, thank you and I promise, the postings will increase!! Stamps: log-CTMH, small alphabet-SU!, large foam alphabet-Heidi Swapp, chocolate chip-Baked with Love by CHF, Lovely as a tree-SU!, Background stamp-Itty Bitty Backgrounds-SU! You clever girl–what a great treat to give your friends! yummy!!! i love making smores!! will have to try that pb/chips trick next time!! bet your friend loved it – such a great gift! !`Cdon't know what happened but your blog stopped showing pics there for awhile in my reader so I've been letting them stack up — was so happy today to see them! !hope you are well! it's been a wild summer, huh?! i'm looking forward to a schedule again! Oh, that is SO ADORABLE! What a fabulous idea and very creative! WAY too cute for words! Great job!